The savory, salty, and delicious taste of dry, cured meat is now within your grasp with the Stagionello curing cabinets from Omcam. You'll able to achieve quality meats, such as salami, in as quick as twenty days. But first: what is meat curing? Curing meat is the oldest method of food preservation. Stagionalleo curing cabinets work alongside some basic principles. 1. Salt or nitrate pull out every drop of moisture to avoid spoilage. 2. The amount of salt for nitrate should equal 3% of the meat's weight. Factors that affect the curing process are breed, diet, fat content, and size. After you're prepared, Stagionello will handle the reset. 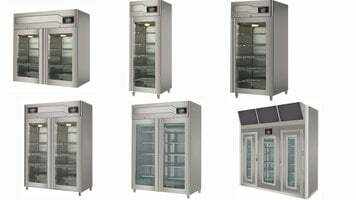 You'll be proud to showcase your products when they're surrounded by the beautiful stainless steel body. When your customer finds that perfect piece, you can easily access any area of the unit to provide it for them. But don't make it too easy - lock up are goods until you're ready to sell them. Helping you get that perfect product is the climate touch menu and operating system, which is loaded with hundreds of preset recipes Additionally, the simple interface allows you to make custom ones as well, making the possibilities endless. And that's just scratching the surface. Featuring the fumotic system - you can infuse flavors and spices directly into the air of the chamber. All these parameters are monitored by the four built-in probes. The humidity probe monitors the ambient humidity within the entire chamber. The ambient probe monitors the temperature inside the chamber. The evaporator probe visualizes the temperature of evaporation. And the condenser probe regulates the function of the refrigeration process. When it comes to cleaning and maintenance, the non-mono block system on top of each unit allows for incredibly simple access to the cabinets inner-workings. Now all all you have to do is choose the right size for your business from our wide range of sixty kilograms all the way up to eight-hundred kilograms. 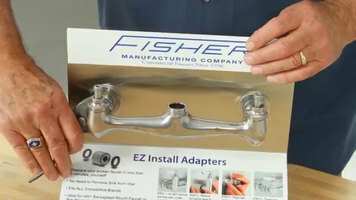 Capable of fitting just about any faucet in a commercial kitchen, these Fisher EZ-Install adapters are simple to install with simple, everyday tools. Check out this video to see how they're used! 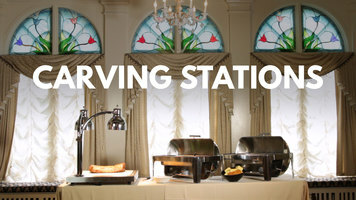 Ever wonder about the various types of carving station bases and heat lamps available in the industry? Watch this video to learn about the benefits each of them has to offer and then decide which one works best for you!